So, since I decided to make a big deal about how I thought #5 Michigan State should be a #1 seed during March Madness in yesterday’s post, they decided to lose their game against #20 Indiana. They didn’t just lose, they got killed. Although Draymond Green scored 29 points on 10 of 17 shooting from the field (3 for 6 three-pointers), he could not help the Spartans out of this one. He also grabbed 8 rebounds. However, he did commit 6 turnovers that turned out to be quite costly. Unfortunately, no one else on his team was able to score more than 8 points. 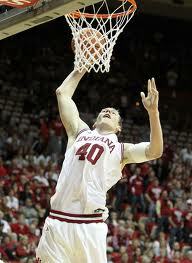 The Hoosiers were able to pull this one off led by stand-out freshm an forward Cody Zeller (to the right). Zeller only committed 1 turnover and scored 18 points. Junior forward Christian Watford was able to record a double-double with 10 points and 14 rebounds during a team high 33 minutes of floor time.